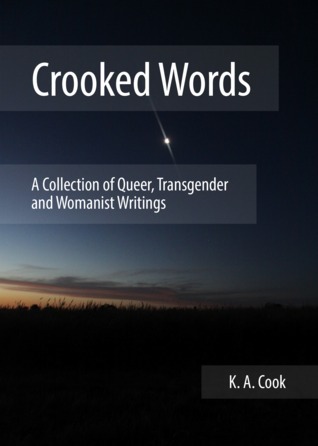 K. A. Cook is a masculine-presenting genderless pansexual feminist queer driven to write about non-binary and unconventional souls, mental illness, chronic pain and strong women. Currently a Professional Writing and Editing student, K. A. dreams of starting an e-press publishing queer non-romance genre fiction. In the meantime, K. A. spends their time collecting swap cards and fashion dolls, writing long and reflective blog posts, and coming up with ever more inventive ways to turn their life experiences into fiction. A young transgender magician travels the world on a quest for a mystical talking sword. A witch wonders why her would-be lovers can’t date her the old-fashioned way. A cross-dressing man meets a suit-clad soul whose gender defies definition. A non-binary zombie wishes ze were the hero in science-fiction stories. A genderqueer manservant tries to save her mentally-ill lover with a deck of tarot cards. A boy looks at himself in the mirror and ponders the fear of telling his family that his name isn’t Susan. ~Misaimed Audience: I will put in a cisclaimer here, I’m a cis-woman reading and reviewing a book meant for a Transgender and/or Queer audience, so there might be things I haven’t picked up on or maybe I’ve missed something (please let me know in the comments). I’m also far from an expert on this topic, but I enjoyed the book and I figured, if I could enjoy it despite not being the target audience, than perhaps other cis-people could enjoy it too. ~Book Structure: As I’m a primarily plot-orientated writer and/or reader and Kim is primarily a character-orientated writer, I would have preferred to read “Everything in a Name” before I read “Blue Paint, Chocolate and Other Similes” (I’m assuming these stories are connected, this might not be the case). The character state of mind in “Everything in a Name” (awkward, nervous and walking-on-eggshell social interactions with straight cis-gendered people) versus “Blue Paint, Chocolate and Other Similes” (confident, happy and safe social interactions with other MOGAI people) would have had a bigger impact in my mind. As a plot-reader, a character-orientated writer has to prove to me “why should I care about this character?” and “What is this character’s journey?”. With those two stories, I can see the direction of Chris’s future character development, but I also need those interconnecting story points to be a little more obvious, but perhaps that’s just me. ~The Unnatural Philosophy of Kit March: Now, the first story of the anthology is “Certain Eldritch Artefacts”, which has recently been revised, here’s the link (I recommend readers who enjoy fantasy to go check it out). Some readers might think Darius’ chapter is a small slice of a larger narrative, and they would be right! In fact, the reason I read Crooked Words in the first place was to read the prequel “Certain Eldritch Artefacts”. Although there are many enjoyable short stories, “Certain Eldritch Artefacts” would have to be my favourite. ~Adventures in Port Carmila: I’m assuming that “The Differently Animated and Queer Society” takes place in the Port Camila universe along Death Is Only A Theoretical Concept (my apologies if this isn’t the case), like with “Certain Eldritch Artefacts”, I get the feeling that “The Differently Animated and Queer Society” is a smaller chapter that is apart of a much bigger narrative (and not a self-contained short-story), but I don’t think this is a negative thing. Especially since it does contain amusing references to Centrelink and discussions on sci-fi representation (the more Farscape mentions the better, as far as I’m concerned). In conclusion, Crooked Words claims to be “an eclectic collection of short fiction in pursuit of the many different shades of what it means to live queer” and I think the novel fulfills that expectation with the added Australian sub-text and references thrown in for good measure. The characters are engaging and authentic and Kim shines when it comes to understanding emotions and empathy for their characters. I enjoyed reading Crooked Words and I’m happy to recommend.